Blocks of ice can last a shocking long time if stored correctly. In the 19th century, Fredric Tutor made his fortune shipping ice from frozen American ponds all the way to Cuba. With the convenience of electricity, we don’t need to harvest ice from ponds anymore. But sometimes electricity stops working, such as during Hurricane Sandy. To prepare for such a scenario where business as usual comes to a sudden grind, you may want to make an emergency bucket, full of supplies that can come in handy during such circumstances. 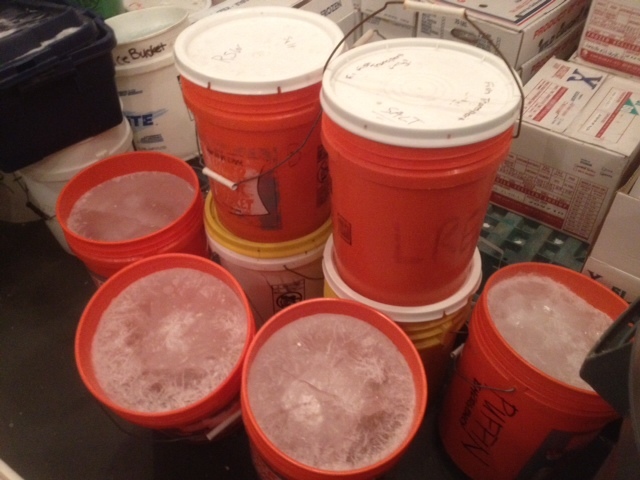 These bucket-shaped ice blocks were made by the National Aquarium in Washington DC in preparation for Hurricane Sandy. If they had lost power these would be instrumental in regulating water temperatures for their aquariums. If any readers know how long this ice would stay frozen, please share in the comments! Probably a good long time. I’d guess about 3 days and that’s if they were 80 degrees or higher. If it was cooler out, probably a week or longer. If you mix in sawdust with the water (about a 20/80 dust/water) you will see this ice last over 10 times longer. It is also about 10 times harder, 10 times stronger and a fun talking point (and yes there is diff between stronger and harder). Only draw back is there is now sawdust in your ice….but there are still many applications.